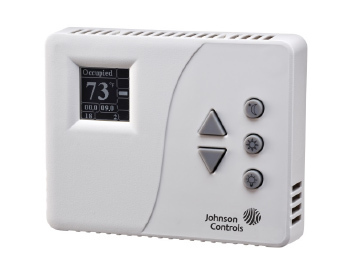 On November 1, Johnson Controls released its latest series of room thermostats to global markets. The WT-400 Series Wireless Pneumatic-to-Direct Digital Control Room Thermostat system is ideal for replacing existing two-pipe pneumatic room thermostats, such as the Johnson Controls T-4002 series, especially when a complete pneumatic system upgrade is not an option. The product’s wireless mesh communications offer a robust network that provides facility managers with previously unavailable heating and cooling information as well as the ability to manage room conditions remotely. This new capability provides reliable zone comfort and enhanced energy economy and also facilitates trending of floor space usage. The WT-4000 Series Room Thermostat family includes stand-alone pneumatic-to-DDC thermostat models with internal programmable scheduling. Non-ZigBee™ wireless communications require the WT-ROUTER and WT-BAC-IP Gateway to integrate the thermostat data into the building automation system which prepares customers for future upgrades by installing building automation infrastructure along with the pneumatic-to-DDC upgrade.